In between programmes of music by Karlheinz Stockhausen, Colin McPhee and Alvin Curran I have been working on three Christmas specials commissioned by Future Radio featuring Tchaikovsky's great ballets. The hour long programmes will be presented by my wife, and musical highlights from each ballet are linked by a summary of the plot. The project has been a delight from start to finish, and not only because my wife is easier on the ear (and eye) than me. What wonderful music Tchaikovsky wrote, and that's a view shared by some pretty influential people. 'The sheer inventiveness of Prince of the Pagodas is extraordinary - so many memorable ideas - as is the sustained brilliance of the orchestral writing. The quality of the music is the equal of the Tchaikovsky ballets, which served as Britten's model for a large part of the score (Ronald Duncan recalls that Britten told him he kept a score of Sleeping Beauty beside his bed while writing the piece)' - from Britten by David Matthews (Haus Publishing ISBN 190434139). 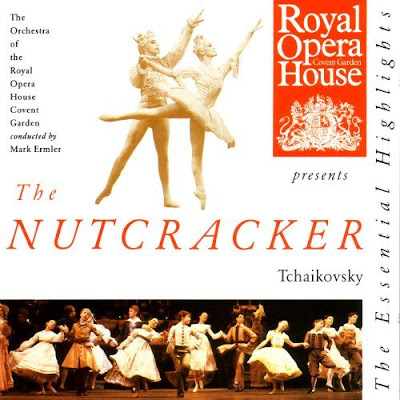 Our programmes use the recordings of the Tchaikovsky ballets made by the Orchestra of the Royal Opera House, Covent Garden conducted by Mark Ermler (sleeve above). These were recorded for the now defunct Conifer label in the late 1980s. They were chosen for their authentically Russian style and excellent sound captured in All Saints' Church, Tooting, with the bonus that the wordless chorus in the Dance of the Snowflakes scene in the Nutcracker is sung by the local Halesworth Middle School Choir. The conductor Mark Ermler (1932-2002) was born in Leningrad and worked with the Bolshoi Theatre as well as Covent Garden. He had a wide repertoire and conducted the first public performance of Prokofiev's last opera Story of a Real Man in Moscow in 1960. Our Christmas ballet specials are being broadcast by Future Radio on FM locally in Norwich, UK and worldwide on the internet on Christmas Day (Nutcracker 6.00pm), Boxing Day (Swan Lake 3.00pm) and New Year's Day (Sleeping Beauty 4.00pm). The audio stream can be launched from the right side-bar where there is also a time zone converter. In November 2007 Future Radio commissioned an independent listener survey, and this showed that 5.5% of the station's total audience listened to the Overgrown Path programmes, a figure that is not too far behind some of their specialist rock shows. I am only too aware of the danger of comparisons across different data sets, but to give a perspective RAJAR figures show that 1.2% of the total UK radio audience listens to BBC Radio 3. The results of the Future Radio survey are very pleasing as the basic rule for my programmes has been 'no compromise'. All the works are broadcast complete, there are no long-winded explanations of the music, no cult of the presenter, and no listener phone-ins. Around 95% of each programme is music, and linking announcements are minimised. This allows the music to speak for itself and the listeners to judge the music for themselves. The composer listings for the five months that the programme has been on air are also strictly 'no compromise' - Pierre Boulez, Elisabeth Lutyens, Colin McPhee, Elizabeth Maconchy, Karlheinz Stockhausen, Vanessa Lann, Lou Harrison, Beata Moon, William Alwyn, Thea Musgrave, Alvin Curran, Paul Creston, Judith Weir, Terry Riley, Rebecca Saunders and many more. Overgrown Path radio is an experiment that is just a small part of a long tail. But the results of the listener survey show that when you treat your audience as intelligent equals they respond. That is something much bigger radio stations have forgotten. And they have also forgotten the vital point made by Libby Purves' in her book Radio: A True Love Story. "All that you can do is to make - and publicise - the best and most passionately well-crafted programmes you can think of. Ratings have to be watched, but calmly and with a sense of proportion. You have to believe that if even one person is swayed, or inspired, or changed, or comforted, by a programme, then that programme has been worthwhile". 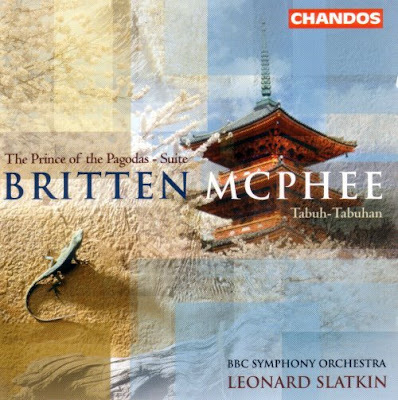 Now playing - Britten's The Prince of the Pagodas Suite with Leonard Slatkin conducting the BBC Symphony Orchestra. Regular readers will know that Leonard Slatkin's lacklustre tenure with the BBCSO did not make me a big fan of his conducting. This Chandos CD, which couples the Britten ballet suite with Colin McPhee's Tabu-Tabuhan and the 1941 recording of Britten and McPhee playing a Balinese transcription for two pianos, is a good summary of Slatkin's period with the orchestra. The CD is worth buying for the performance of Tabu-Tabuhan which is persuasive, and this is the recording I used for my recent webcast. The Britten suite is useful for those who don't want to invest in Britten's own recording of the complete work, but there is little else to recommend it. The performance sounds under-rehearsed and routine. Fine for a budget release of a concert performance, but not for a full price CD. More wonderful Tchaikovsky from Russia here. Elsewhere it is nice to see that BBC Radio 3 has the theme of 'forgotten Brits' for their morning programmes this week. Today it was Edmund Rubbra's Fifth Symphony (which I broadcast on Nov 18). Tomorrow it is music from Elisabeth Lutyens and Elizabeth Maconchy (who featured on Future Radio on Sept 9). As always, another beautiful post, Pliable. and his gamelan pieces on New Albion, esp his piano piece Pandok (New Albion 53). Balinese music in the manner of McPhee is alive and well. While over on BBC Radio 3 this morning presenter Sarah Walker manages to play Copland's Clarinet Concerto instead of Barber's Second Symphony, and doesn't seem to be able to tell the two works apart. Britten's recording of the "Pagodas" is abridged, which is a pity, but I still greatly prefer it to Oliver Knussen's complete recording. There is a good version of "Tabuh-Tabuhan" conducted by Hanson on the Mercury label. Dear Pliable, As memory serves, only the first of the ROH Ballet series - Swan Lake - was recorded in All Saints Tooting. The others, together with some Prokofiev, Adam etc were recorded in All Saints Petersham and St Judes Hampstead Garden Suberb, both of which, as orchestral recording venues, are now as defunct as the Conifer label.